FANS inside the American Airlines Arena went nuts Wednesday night. Drowning in euphoria, they got almost unbearably loud and waved white towels with unsuppressed frenzy. Tears fell, happy tears, And there were oodles and oodles of hugs. Free hugs to anyone within a whisper's distance from a Miami Heat player. It was a festival of fist bumps and high-fives. So many people were so happy you'd think Oprah just gave each one of them a car. But that wasn't quite the case. The celebration was triggered by the downfall of the Boston Celtics, who lost to the Heat 4-1 in their best-of-7 Eastern Conference Semifinals showdown. The final, fatal blow came with just 4:15 left to play in Game 5, when the Heat dropped a 16-0 bomb on the way to a 97-87 win. Although this was only a second round series, this wasn't just another opponent. The Celtics were the old gatekeepers of the East, former champions whose franchise represents tradition and excellence in the form of 17 NBA titles. In recent years, the Celtics and its Big Three -- Kevin Garnett, Paul Pierce and Ray Allen -- had tormented Miami's superstar pair of Dwyane Wade and LeBron James. Separately, Wade and James couldn't get past Boston. But when James left Cleveland last summer to join Wade in Miami, the seeds of vengeance were planted. This year, in this playoffs, Wade and James finally got over the hump. They proved that a Big Two can beat a Big Three. "Those two guys are monsters. When they make shots, it makes it very difficult," Celtics head coach Doc Rivers said of Miami's double trouble. Wade finished with a game-high 34 points on 13-of-19 field goals. He grabbed 10 rebounds and fired five assists. The 6-foot-4, 220-pound D-Wade did most of the dirty work in the first three quarters, when the Heat struggled to stay afloat after trailing early at 24-16. ALTHOUGH Celtics point guard Rajon Rondo didn't play in the entire fourth quarter because of a busted elbow, the Celtics held their ground and led 87-81 late in the fourth period. That's when the 6-foot-9,250-pound LeBron carried Miami with the might of his all-around brilliance. 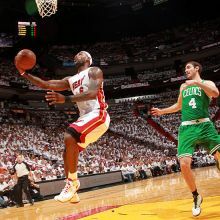 With 2;10 left in regulation and Miami grasping at straws, 87-90, James swished a 3 to tie things up. After both teams exchanged missed shots and missed opportunites, James drilled another 3 and pushed Miami ahead 93-87, time down to 40 seconds. Four seconds later, James stole an errant Delonte West pass and streaked downcourt for a slam dunk that sealed the outcome for good. All told, James piled 10 of the Heat's final 16 points. He ended up with 33 of 11-for-20 shooting. He made 5-of-7 3s and 6-of-9 free throws. James, 26, also had seven rebounds and four assists. Ray Allen led the Celtics with 18. Garnett had 15 while Pierce added 12. The Celtics as a whole did well offensively, making 33 of 67 shots, including 7 of 15 three-pointers. But they got outrebounded badly, 38-30 and they had no answer against the assault weapons that were James and Wade. And just like the Lakers, the Celtics looked old and done as their coach contemplates life outside basketball. Miami, however, is far from done. They await the winner of the other East semifinals featuring the Chicago Bulls and the Atlanta Hawks.